Did you like my post about Instax Mini 8 ?I am sure you did! I have now a fabulous competition for you! Win Instax Camera with the same bag as I have! Terms & Conditions;UK ENTRANTS ONLY! Prize: Instax Mini 8, Baby Blue colour plus white shoulder bag/case (instax cover with strap) Competition ends 15/08/2015 and the winner will be announced on Twitter within 48h of closing date from @DontCrampMyBlog account! 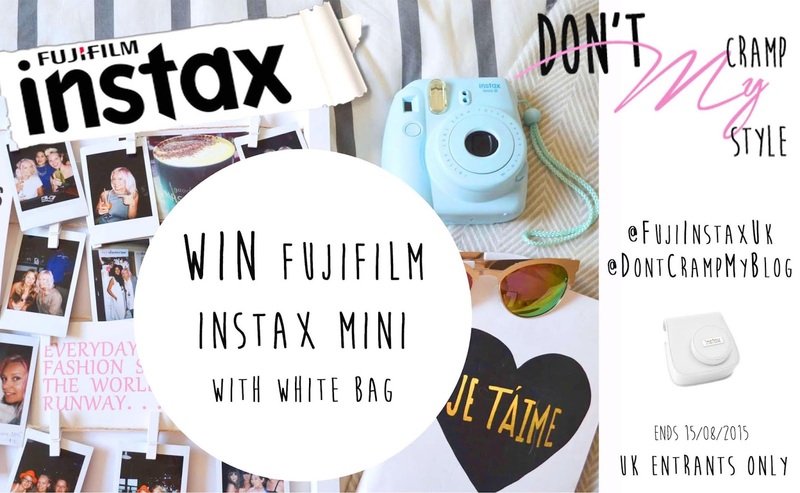 Re-tweet Competition post on Twitter & Follow @FujiInstaxUK & @DontCrampMyBlog to enter. Only 1 RT & Follow give you the chance to win. No need for multiple entry. Number of comments or multiple RT won’t give any extra chance and we discourage you to do so. We will check all entries been made between 05/08/2015 13pm until 15/08/2015 12pm. Winner will be chosen at random. 50 shades of blue! The ‘SS15 Blue Hues’ fashion show by Mcr Fashion Industry. How and Why you should become the community spirit of 2018 and look after your own town. Just voted for you…and adore this baby blue! 🙂 RT@TTCM76 and loving your blog! entered! brilliant competition 🙂 I would love to take this to Reading Festival! this would be prefect. Defiantly the best way to capture 'in the moment' memories! Lovely prize, this may just be the cutest camera I have ever seen. Such a cute giveaway! Voted for your blog on the Interior Blog Awards btw! Brilliant competition 🙂 All entered, thank you very much! I'VE WANTED ONE OF THESE FOR SO LONG!! Thanks so much for this awesome giveaway!! Thank you Anna! Another lovely giveaway! Such an amazing giveaway! I bought my sister one of these Camera's as a Getting into Uni present and ever since then I have been dying to get one!